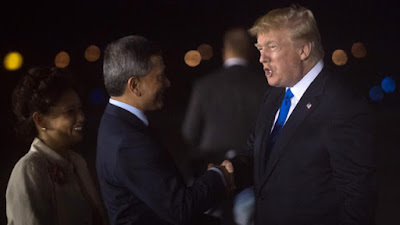 North Korean leader Kim Jong Un and Donald Trump arrived in Singapore Sunday for an unprecedented summit, with Pyongyang’s nuclear arsenal at the top of the agenda and the US president calling it a “one-time shot” at peace. It is an extraordinary turnaround from the tensions of last year, when Kim accelerated his weapons programmes — earning the North more sets of UN Security Council sanctions — and the two men traded personal insults and threats of war. Kim arrived in Singapore on board an Air China 747 that according to flight tracking website Flightradar24 took off from Pyongyang in the morning ostensibly bound for Beijing, then changed its flight number in midair and headed south. He was driven into the city centre in a stretch Mercedes-Benz limousine accompanied by a convoy of more than 20 vehicles, and later met Singaporean President Lee Hsien Loong, thanking him for hosting the event. “If the summit becomes a success, the Singaporean efforts will go down in history,” Kim said. Authorities imposed tight security around the Singapore summit venue and the luxury hotels where the leaders were to stay — including installing extra pot plants outside Kim’s accommodation to obstruct reporters’ views. But the value of the event — long sought by the North, and which Trump apparently impulsively agreed to in March, reportedly without consulting his advisers — has been called into question. “People call it a historic summit but… it is important to understand that this summit was available to any US president who wanted to do it and the point is no US president wanted to do this, and for good reasons,” said Christopher Hill, a former lead US nuclear negotiator with North Korea. The North invaded the South in 1950 and the ensuing war pitted US-led UN troops backing Seoul against Pyongyang’s forces which were aided by China. The conflict ended in an armistice which sealed the division of the peninsula. Last year it carried out by far its most powerful nuclear test to date and launched missiles capable of reaching the US mainland, while Trump threatened the North with “fire and fury” and Kim dubbed him a “mentally deranged US dotard”. But the South’s Winter Olympics in February were the catalyst for a flurry of diplomatic moves as South Korea’s dovish leader Moon Jae-in sought to bring the two sides together. Kim has met twice with both Moon and Xi Jinping, the president of China, long the North’s most important ally. But Trump baffled observers when he said he did not think he had to prepare “very much” for the summit. “It’s about attitude,” Trump said. “So this isn’t a question of preparation".